Ham and Bean Soup is a great way to get extra mileage out of a Double Smoked Ham. You take the leftover smoked ham bones and slow simmer them on the stove in a pot of beans. I always make several hams around the holidays, so I stash away a couple bones just so I can make this ham and bean soup recipe on a cold winter day. I also try to leave a decent amount of meat on the bone to make sure our soup ends up nice and meaty. You can always supplement with chopped ham if you feel yours is too picked over. One of the easiest (and most delicious) holiday meals you can make on your barbecue pit is my double smoked honey glazed ham recipe. It’s called “double smoked” because you start off with a pre-cooked (and smoked) ham, then use your smoker to warm it up. The whole thing gets topped off with a thick coating of sweet honey glaze before serving! Earlier this week I made an appearance on local news station Fox 4 KC to help promote the upcoming American Royal BBQ Contest. I was showcasing my Smokey Kansas City Pit Bean recipe that we will be turning into the judges later this weekend. This bbq bean recipe is sweet, spicy, meaty, smokey, and feature the bold flavors of our Smokey Kansas City Barbecue Sauce! Smokey Kansas City Pit Beans have been a multi-year winner at the American Royal and will be a sure hit at your next barbecue. Ever since the EAT Barbecue sauces and rubs made their way into our warehouse last week, I’ve been anxious to give them a test run. Their arrival just happened to coincide with Memorial Day weekend, which also happened to be a rare off-weekend for our competition barbecue team, Burnt Finger BBQ. Since I’m always looking for reasons to fire up the smoker, we decided to use the long weekend to put the EAT Barbecue products to use and see how they perform first-hand. Birthdays only come once a year, and milestone birthdays only happen once in a lifetime. It just so happens that I recently passed one of those milestone birthdays and ticked over into the big 30’s. Some people like to spend these occasions relaxing on a beach, or sulking about father time catching up with them, but I saw this as a prime opportunity to expand my barbecue horizons into a category of cooking that every great pitmaster must dabble in. So I treated myself to a pre-birthday present by purchasing a La Caja China hog roasting box and set out on my first pig roast! This weekend I was watching reruns of Alton Brown’s Good Eats (one of my all time favorite cooking shows), and I caught an episode that was completely dedicated to cooking with alcohol…well, mainly wine and beer. Lately I have taken an even more increased interest in incorporating these flavors into my own cooking, so I quickly hit the record button on my DVR. Coincidentally, Alton proceeded to breakdown the science behind two specific recipes that I have been experimenting with extensively myself; wine marinated lamb steaks and beer bread. But that wasn’t the nugget of information that piqued my interest. In it’s purest form, a fatty is most easily described as those sausage chubs that you can find at most grocery stores. The brands can vary (especially when dealing with smaller local markets), but some of the most common national brands are Jimmy Dean, Bob Evans and Hormel. The concept is simple, but extremely effective. Carefully remove the plastic sleeve leaving the “chub” shape intact, season with your favorite barbecue rub, and toss it on the smoker. Sound familiar? Well, this is the technique that inspired our Bacon Explosion. Every year for St. Patrick’s Day I load up the smoker with corned beef brisket to make homemade pastrami. Being Irish, this is the perfect meal that combines my heritage with my passion for barbecue. This year’s pastrami smoke-out took place a couple weekends ago, and was once again a huge success. But now that I’ve been eating sandwiches for the better part of two weeks, it’s time to throw a little variety into the mix. My buddy Gish was having a grilled pizza party for March Madness, so we packed up the pastrami fixins to test out a new grilled Reuben pizza recipe. 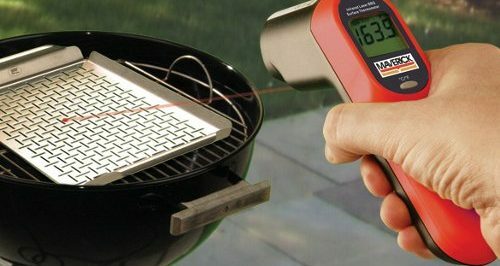 Recently we got our hands on a Maverick Laser Surface Thermometer to test out and provide our thoughts. Of course we wouldn’t want to dangle a brand new piece of equipment in front of our readers without giving you a chance to win one, so we also have another thermometer that we’ll send off to one lucky reader! Keep reading and we’ll let you know how you can get your hands on one of these guys. Cooking up a barbecue feast for your friends and family can (and will) be an all day affair. Depending on the size of your cut, briskets and pork butts can take every bit of 18 hours to slow smoke to perfection. As much as I like starving myself all day in anticipation of the gluttony that’s soon to come, my willpower tends to falter somewhere around the noon hour. Since the smoker is already chugging away, there’s no need to power up the oven for that well deserved mid-day snack. Instead, I prefer to toss in a few stuffed jalapeno peppers…especially the ones dubbed “Atomic Buffalo Turds”!! !